They wink at us every day from computer screens and stereos. But the humble LED is heading for a brighter future. New generation Light Emitting Diodes will purify water, make lights that mimic the colour of sunshine, and keep private data immune from hackers. Dr Rachel Oliver, an LED researcher from the University of Cambridge, thinks that they could easily succeed tungsten bulbs as the main way to light our homes. "LEDs have enormous benefits over standard light bulbs because they're a great deal more efficient, come in a range of different colours and have a very long lifetime. They are also good at saving energy too," she told BBC Radio 4's The Material World programme. "We could also light up out of the way places where normal bulbs are unsuitable," she added. "Because they last such a long time, architects could cover the side of a building with exciting lighting effects without worrying about constantly replacing the bulbs." LEDs are made from two halves of a special material called a semiconductor. One half is filled with negatively-charged electrons and the other with positively-charged areas called holes. Where the two halves meet, the positive and negative charges join together - causing the electrons to emit energy as photons of light. The colour of this light, and thus the LED, depends on the material that is used. Gallium arsenide gives off red light, while gallium nitride produced blue. "Blue LEDs were the holy grail for a long time," said Professor Jan Evans-Freeman, head of the Centre for Electronic Devices and Materials at Sheffield Hallam University. "But now blue LEDs are used everywhere, including the backlighting on mobile phones. Gallium nitride has proved to be a very effective material." Researchers are now using gallium nitride to move beyond blue and into the ultraviolet. The hope is to convert this into white lighting suitable for our homes. White light is produced in an LED when UV light reacts with a phosphor coating on the inside of the bulb. As LEDs are around 40% efficient, this makes them an attractive alternative to the 5% efficiency of tungsten bulbs. The problem is the type of white light they produce. "The white light they give off is a cold light because it contains lots of blue," said Prof Evans-Freeman. "It's hard to know whether people will accept this kind of light in their living room." But active research into phosphor chemistry could provide a solution. Dr Oliver said: "We're aiming for white light that looks like sunshine, and there are scientists trying to mix phosphors in just the right proportions. If we can achieve this, the white will not only look warmer, but could also be useful for people with Seasonal Affective Disorder." 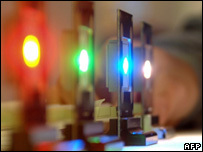 Ultraviolet LEDs also have the potential to revolutionise water quality in the developing world. A high-energy form of ultraviolet light known as deep-UV kills bacteria and viruses without the need for chemicals. For this reason, deep-UV is commonly used for sterilising water. But conventional UV lamps are bulky and need replacing regularly. LEDs are significantly smaller, cheaper and have lower energy requirements. "It's especially exciting from a third world perspective because LEDs could run off solar power or even by some sort of clockwork mechanism. This would bring water purification to people in remote areas," said Dr Oliver. "But making deep-UV LEDs is a big technological challenge," she said. "Deep-UV can't be made from the combination of materials we're used to, although I certainly think it's possible." LEDs are currently expanding into the realms of computer security through a method known as quantum cryptography. It involves sending out a stream of individual photons from one computer to another. Information can be encoded onto each photon. But the laws of quantum mechanics mean that once someone reads the information, the data on the photon changes. If one of the photons in the stream is intercepted by a hacker, the information is altered and the message corrupted. "This will immediately alert the sender and recipient that someone is trying to read the secret message," said Oliver. "The sender can then recode the message and send it again." Quantum cryptography is not yet sufficiently advanced to be used as a standard technology, but shows promise for ultra-secure internet banking and online data protection in the future. "People could be using it for financial transactions over the internet in the next 10 or 20 years," she said. Centre for Electronic Devices and Materials at Sheffield Hallam University.